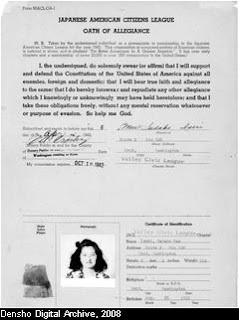 Why does the issue of loyalty remain so divisive in the Japanese American community even today? This month's "From the Archive" article looks at a painful and contentious aspect of the wartime experience -- the role of the Japanese American Citizens League (JACL) in crafting what scholar Eiichiro Azuma calls a "master narrative" of Japanese American history. This narrative, actively promoted by the JACL, constructed an image of Japanese Americans as superpatriotic and unwavering in their support of the United States- - the "quiet Americans" as one Nisei author put it. Not an expose or attack on the organization, the article instead explores the process of history making and attempts to understand why, after seventy years, the Japanese American community has yet to fully reckon with the legacies of the incarceration.